A Royal Flush Draw That Doesn't Get There: Bluff River or Give Up? Bluff or give up with a busted royal flush draw? A "would-a should-a" hand from @JonathanLittle. 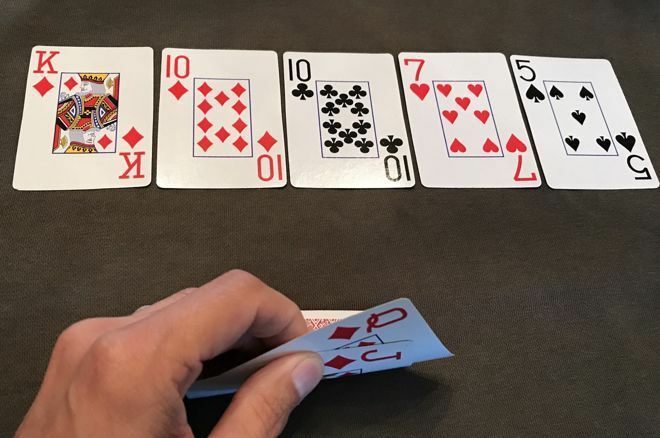 Consider how you'd have played @JonathanLittle's open-ended royal flush draw in this tournament hand. This week I want to share an example of me looking back on a tournament hand where in retrospect I feel I might have played it differently — and if I had I might have won the hand rather than lost it. With a stack about 33 big blinds deep, I picked up in middle position and open-raised 2.67x to 800, and only the big blind called. The flop brought both good news and bad news, coming to give me an open-ended straight draw and flush draw — and a royal flush draw! — although the board was also paired. My opponent checked, I bet 800 (a little under half-pot), and my opponent called. The turn was the and my opponent checked again. At this point I had to think about what range of hands was suggested by my opponent having check-called the flop. As I discuss in the video below, that range includes good ace-high hands, and hands, , and small pocket pairs among other possibilities. In other words, my opponent's range included a number of hands he would never fold to a turn bet as well as a number of hands he would always fold to a turn bet. I also had to think about what I would do if I bet and my opponent check-raise shoved on me, as I still had a lot of equity (although not all of my outs were necessarily clean). I ultimately chose to check behind on the turn, then the river brought the , missing all my draws. My opponent checked again. Now I found myself in a spot where I probably had to bluff to win the hand, but what hands could my opponent have that he would fold? Watch below to hear me discuss this spot and my decision, and see how things played out. As I say in the video, after going around and around debating with myself what to do on this river, recognizing that my hand was one of the worst in my range meant I probably should have bluffed. In fact, I could have shoved. But I didn't, and indeed lost a hand I might well have won had I bet.